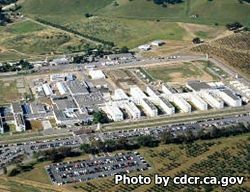 California Medical Facility provides essential health care needs of male inmates incarcerated in California. The facility has a hospital within it, psychiatric facilities that can treat a variety of disorders, housing and treatment for HIV positive inmates, and even a hospice unit for inmates who have been diagnosed as terminally ill. Although it is a medical facility, the facility still provides basic treatment programs for inmates, including the basic adult education and GED program, as well as substance abuse treatments. Vocational opportunities for inmates includes landscaping and horticultural classes, custodial duties, and courses on electronics. Many of these jobs not only provide essential operations within the institution but give the inmates a set of skills they can use after they are released. You must have an approved visitors application prior to your visit. Inmates may have visits on Saturdays and Sundays from 8am-3:30pm (Including 4 major holidays; Christmas day, New years day, Thanksgiving and July 4th). You will not be admitted to visitation if you arrive after 2:30pm. Visitors may also schedule a visiting appointment online here.